hummm j'ai hate de voir la set liste ! oh yeah mes amis, yeah !!! super l affiche a mettre dans le salon au desss de la sono !!! Moi, j'y crois encore ! Je pensais que l'année 2010 serait une année noire, comme on a plus ou moins connu en 2006 et en fait non :! J'annonce même en exclusivité un SECOND HOLLYWOOD BOWL!!! Up And Coming Tour : 3 nouvelles dates ! Second Hollywood Bowl Show Added Due To Pre-Sale Demand! Due to unprecedented demand, a second show - March 31 - has been added for Paul McCartney's Up and Coming Tour at the Hollywood Bowl. Tickets will be available to American Express cardholders exclusively now through Saturday, February 27 at 10 p.m. The public on sale for both the March 30 and 31 dates remains Sunday, February 28 at 10 a.m.
McCartney’s extensive Up and Coming 2010 tour will begin Sunday, March 28 at the Jobing.com Arena in Glendale, Arizona--Paul’s first appearance in Arizona since 2005’s completely sold out 37-date US Tour. In keeping with his headline - making special concerts over the last few years, the Up and Coming tour will see McCartney and his band play unique venues, places and locations in both new cities he’s never played and familiar markets he’s not visited for a while. The March 30 and 31 Hollywood Bowl shows mark McCartney’s first shows at the legendary venue in 17 years. Paul first appeared at the Bowl with The Beatles 46 years ago in August 1964 and then again a year later in August 1965, shows that were recorded for a live album (The Beatles At Hollywood Bowl) not released until May 1977. The Arizona and California dates will be Paul’s first US shows since his five - week Summer Live ‘09 tour last year, which was prefaced by a triumphant sold out headline set at the 2009 Coachella festival and a surprise performance for the Late Show with David Letterman on the marquee of the Ed Sullivan Theater (inside which The Beatles made TV history decades ago) that drew throngs packing Broadway from Columbus Circle to Times Square. The ‘Summer Live ‘09′ tour began in earnest with an already legendary inaugural run of shows at New York’s Citi Field Stadium, the site of the former Shea Stadium where The Beatles played the 1965 concert that set the precedent for the modern day stadium rock show. Critics hailed the Citi Field performances, seen by over 100,000 people, as the concert experience of a lifetime. Those performances were immortalized on last year’s RIAA gold - certified multi - disc CD/DVD Good Evening New York City. The new show will feature a typically diverse set list drawing on 2 hours plus worth of selections spanning the catalogues of The Beatles, Wings and Paul’s solo career, including tracks from The Fireman’s 2008 album Electric Arguments. There will be some never-before-played-on-US-soil songs added to the set list as well as the US live premiere of ‘(I Want To) Come Home’, Paul’s Golden Globe nominated track from the film Everybody’s Fine. More live shows to be announced soon. Keep checking back here! EDIT : 2 nouvelles dates ! 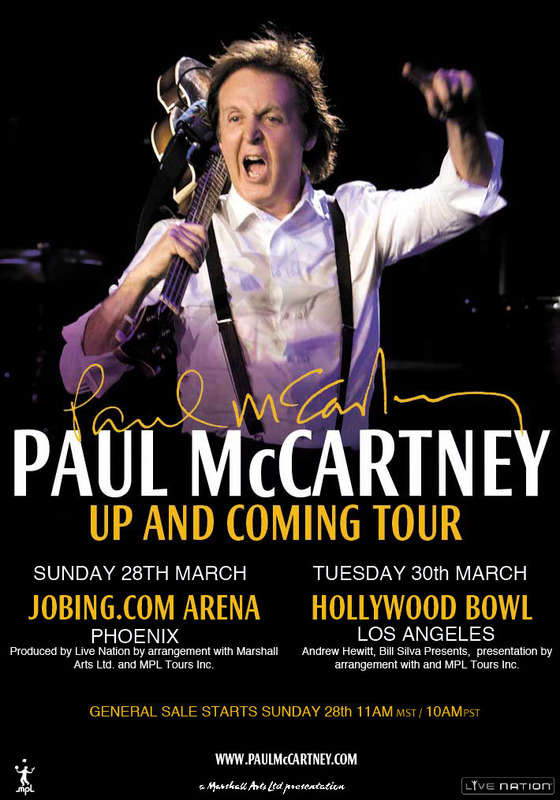 Hot-off-the-heels of announcing the first two concerts of Paul McCartney’s forthcoming ‘Up and Coming Tour’ (Glendale AZ on 28th March and Hollywood CA on 30th March), the rumour mill has gone into overdrive predicting where Macca and his band will turn up next. The speculation ends today with the announcement of two shows that are set to be his hottest of the year. The first is at the Sun Life Stadium in Miami on the 3rd of April; the only Florida appearance of the tour, the April 3 gig is also Paul’s first show in Miami since he launched his massive 2005 ‘US Tour’ at Miami’s American Airlines Arena five years ago. On April 5th Paul will play his first ever show in Puerto Rico. In addition, unprecedented response to the presale for Paul’s March 30 return to the Hollywood Bowl has necessitated the addition of a second show on March 31. Both shows will go on sale to the general public this Sunday, February 28. These new dates are in keeping with Paul’s huge headline making concerts over the last few years, where the world’s biggest rock star has played to millions of people across the globe. These concerts have taken Paul to places he’s never been before, unique settings, venues and locations, and these new dates are no exception. The new tour will feature a typically diverse set list, drawing on two hours plus worth of selections spanning the catalogues of The Beatles, Wings and Paul’s solo career - including tracks from The Fireman’s 2008 album ‘Electric Arguments’. There will be some never-before-played-on-US-soil songs added to the set list, as well as the US live premiere of ‘(I Want To) Come Home’, Paul’s Golden Globe nominated track from the Robert De Niro movie ‘Everybody’s Fine’. To purchase tickets (on sale Sunday 28th), go to Ticketmaster.com,Livenation.com or call 800-745-3000.
et 2 nouvelles dates ! On dirait que Puerto Rico sera une interlude avant d'attaquer l'Amérique du sud comme la rumeur le prévoyait. Ca va etre chaud. Je fusionne vos sujets les gars et on le transforme en topic unique! en attendant, j'ai peur qu'il reparte ensuite en tournée eu Europe en passant par l'Italie, Le Portugal, l'Espagne,...mais pas par la France ! En même temps, ceux-là n'ont pas eu droit à son passage l'an dernier donc ça se comprend. Mais il ne faut jamais dire jamais : ces dates-là étaient imprévisibles donc d'ici qu'il squatte une salle française avec une vente des billets 1 mois avant, ça ne m'étonnerait qu'à moitié. remarque, un autre bercy pour cet hiver, je ne dis pas non ! Paul McC a écrit: remarque, un autre bercy pour cet hiver, je ne dis pas non ! héhé n'oublie pas ton appareil photos dans ce cas là !! Je ne me lasse pas de tes photos de Bercy en tous cas ! ça, ça risque pas ! Paul McC a écrit: ça roule ! la Up And Coming Tour ferait-elle un tour à Glasgow ? Paul McCartney will perform in Glasgow for the first in 20 years, according to a report today in the Scottish Daily Record. There's been no official announcement of the gig as of yet. The paper says the date, which will take place this summer, won't be announced for 48 hours, but will take place June 20 in Hampden Park. "Paul has always loved playing in Glasgow since his early days with The Beatles. He has a great affection for Scotland and his home in Mull of Kintyre in particular," the paper quoted a McCartney associate. He last played the city on June 23, 1990, at the SECC as part of Glasgow's celebrations as European City of Culture. A scheduled show in Celtic Park in 2003 was canceled. "There have been a few missed opportunities over the years but Paul is thrilled Hampden is the venue. He loves Scotland and wants to play there again. It will be one of his greatest gigs ever," the associate told the paper. One interesting note in the story repeats the oft-reported rumor that "Macca's farewell tour will last right up to his 70th birthday," which means McCartney, who'll be 68 this year, could be making his last stops at the upcoming venues on the Up and Coming Tour. Or not. Cette fois le Royaume Uni est concerné avec une mini tournée des stades et festivals. Pour l'instant toutes les rumeurs de concerts se sont confirmées, sauf pour l'Amérique du sud en avril. wah, le truc de malade ! l'isle de Wight et le Hard Rock Calling ! !